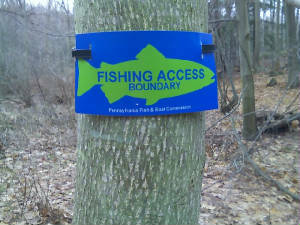 John Simmons, Bureau Director of the Pennsylvania Fish and Boat Commission (PF&BC), traveled to Erie on Wednesday December 13th to present an update on the progress of land acquisition/access to Lake Erie tributaries. Simmons addressed a crowd of approximately 50 members and interested anglers. The Commission is focused on securing access to strategic locations on four targeted streams: Elk, Walnut, Trout Run and Twenty-Mile Creeks. Simmons discussed six easements or land acquisitions (Elk - 3 sections, Walnut - 2 sections, 20-Mile - 1 section) in detail that are near completion. The properties discussed are outside of the Bruger Property on Trout Run which has been completed. Simmons also informed attendees about 15 other easements or land acquisitions that his department is actively pursuing. He was unable to discuss in detail or provide locations, but stated the general areas targeted. Simmons stressed the commitment of the PF&BC to multiplying the Erie stamp money by working with other agencies or organizations such as the Department of Conservation and Natural Resources (DCNR), Lake Erie Region Conservancy (LERC), and the individual townships in Erie County. Several of the projects discussed pooled money from these sources. Addition to the properties near completion and the projects that are being actively pursued, Simmons mentioned 12 other opportunities on the horizon which would total 2.6 miles of stream access.